Three Missouri teams made the field for the NCAA Division II National Football Tournament. Games are scheduled to begin on Nov. 19 at campus sites with everything culminating at Children’s Mercy Park in Kansas City on Dec. 17 with the National Championship Game. Northwest Missouri earned the top seed in Super Region 3 and will earn a bye and await the winner of a first round game. 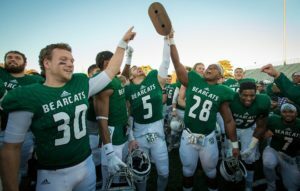 The Bearcats wrapped up their 28th overall MIAA championship yesterday going 11-0 on the year. They are led by Kyle Zimmerman who is averaging 277 yards per game passing with 34 touchdowns through the air. Mules Football earned the No. 6 seed in that same Super Region 3 and will play third-seeded Harding next Saturday, Nov. 19 in Searcy, Ark. The Mules won their final six games of the regular season to finish at 9-2 and earn their first NCAA-II Playoff berth since 2010 and the third in program history. For the first time in school history the Southwest Baptist University Bearcats had made the field of 28 for the NCAA Division II Football Playoffs. The Bearcats earned the #3 seed in the Super Region 4, and will play host to #6 seed Colorado School of Mines on Saturday, November 19 at 1:00 p.m. from Plaster Stadium.